I am sure that many are still 'recovering' from the Thanksgiving Day fest/feast, not to mention the Black Friday buster sales. Now I am not an American, [hope to be one day soon *_*] but because of my close proximity to the USA in terms of my geographical location to places such as Puerto Rico and the United States Virgin Islands, much of what happens in the USA does affect us here in the Virgin Islands (British). 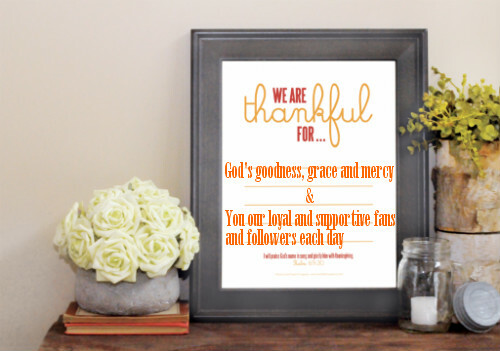 Thanksgiving day, Black Friday sales, Cyber Monday sales, and whatever else comes with the season are nothing if it does not have as its' focal point glad and reverent hearts lifted up to God in honor and praise for His goodness and all of His wonderful works towards the children of men. I am certain that you will agree that life is short. It's full of many challenges, not to mention the way that things have evolved over time - from the day you and I inhaled our first breath in this world when we were born, right up to the day we will take our last breath when death comes knocking at our door. And since no man knows the minute, hour, or the day when that would be, let us look at everyday as a day to give thanks unto God for His loving kindness, faithfulness, His unfailing and unconditional love towards us. And in the words of Maya Angelou, "Let gratitude be the pillow upon which you kneel to say your nightly prayer. And let faith be the bridge you build to overcome evil and welcome good." Want more of EMB? Then like and follow us on facebook, We now have a presence on Pinterest, and Look forward to having you join us! Happy Holidays! Hi, Join Us On Facebook! Visit Yvonne I's profile on Pinterest. License means you may re-use my content. However, please ensure that it is linked back to this blog and correctly attributed to Yvonne I. Wilson, or the author. Additionally, some of the links and banners on this website are "affiliate links." This means that when you click on the link or banner and purchase the item or the service, I will receive an affiliate commission. Copyright 2012-2014 . Simple theme. Powered by Blogger.